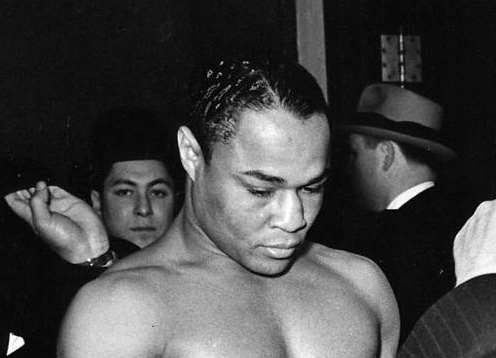 At a time when boxing only had eight weight classes Henry Armstrong simultaneously held world titles at featherweight, lightweight and welterweight division. He collected everything but money in his impressive boxing career. He was a knockout artist with a destructive punch and a killer attitude. 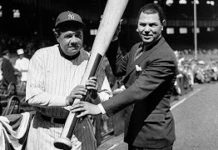 He often appeared overly aggressive, almost reckless, as though he were easy to hit, but the truth was his timing and instincts were amazing, and he did just about everything right. His incessant windmill style dazed his opponents and he was extraordinarily resistant to punishment. 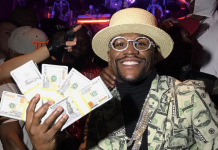 Poorly paid and often cheated out of his ring earnings, Armstrong could rarely afford the high life that often went along with being a world champion, but prizefighting has to this day never seen a more deserving bearer of its top honors. Born in December 1912 in Mississippi as Henry Jackson, Armstrong moved to St. Louis with his family when he was four years-old. As a youngster, he took part in neighborhood street brawls and soon decided that he wanted to become a fighter, realizing he had a knack for dust-ups. During the end of his tenure in high school, he fought briefly in the amateur ranks under the name Melody Jackson. His first professional bouts, a victory and one loss, took place in the Pittsburgh area where Armstrong lived for a short period. 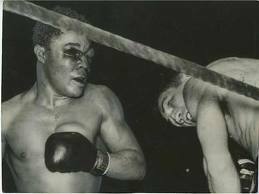 He later moved to Los Angeles where he resumed his amateur status, this time fighting as Henry Armstrong. Making a meager living operating a shoeshine parlor, he won 85 amateur bouts, demonstrating a God-given aptitude for the sport of boxing as he developed his craft within the confines of the squared-circle. After failing to make the 1932 Olympic boxing team, he officially turned professional. Campaigning as a featherweight, “Homicide Hank” fought often in order to support himself. His bouts were sometimes just days apart but despite the demanding schedule he met with great success. In 1934 The Ring ranked him as the sixth-best featherweight in the world in its annual rankings. 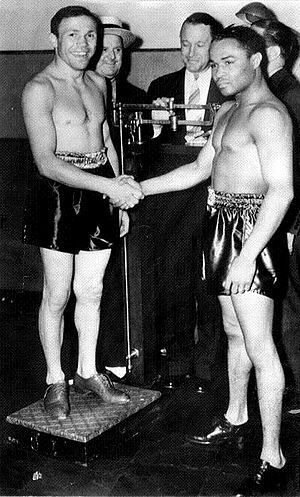 In 1936 Armstrong won a ten-round decision over Baby Arizmendi for the California-Mexico version of the world featherweight title. A year later, Armstrong effectively seemed a force of nature, going 27-0, stopping twenty-six of his foes inside of the scheduled distance. Among his victims was Petey Sarron, the reigning World featherweight titleholder. Armstrong stopped Sarron in six shocking rounds in October 1937 to lay undisputed claim to the championship. If the year 1937 made Armstrong look bigger than life, 1938 proved to be the greatest year of his stellar career. As the reigning World featherweight champion, he challenged a fellow member of the three division champions’ club, Barney Ross, the World welterweight champion for the title. The match was held in the open-air Madison Square Garden Bowl in front of some twenty-eight thousand spectators. Although Ross struggled to make the 147lb weight limit, the end was in fact just around the corner as his career had by that time peaked, and in no way was he prepared to deal with a whirlwind assault that bordered upon the supernatural. For fifteen rounds Armstrong administered a merciless shellacking that had members of the crowd calling for the match to be stopped. Armstrong, 126lbs, beat Ross, 147lbs, by unanimous decision, adding the World welterweight championship to his featherweight belt. 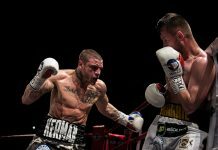 With the both World featherweight and welterweight titles firmly in hand, Armstrong advanced to face reigning champion Lou Ambers for the World lightweight championship. In a brutal encounter, Armstrong floored Ambers in both the 5th and 6th rounds, however Armstrong was so seriously cut around the eyes and bleeding profusely enough at the mouth that the referee considered stopping the contest. Fighting without a mouthpiece, so that he could swallow the blood flowing into his mouth, Armstrong toughed it out and scraped by on a hard-fought 15 round split decision to become the first simultaneous, triple division champion in boxing history. Not long after, Armstrong relinquished the featherweight crown believing he couldn’t make 126 pounds any longer. In 1939, he lost the World lightweight crown back to Lou Ambers in a match where Armstrong was penalized several points for low blows. After that, he concentrated once again on defending the World welterweight title, making eight defenses in a row, the last of which was a 9th round knockout over Puerto Rico’s Pedro Montanez, a bout in which he weighed just a hair over 139lbs, a full pound below today’s limit for the junior welterweight division. So destructive was his showing against Montanez, the New York Times was compelled to comment – “For savagery and bruising fighting, virtually all of it displayed by the irrepressible Armstrong, this was a fight that has seldom been excelled. No welterweight, no man near Armstrong’s inches or poundage could have survived the blistering firepower”. Montanez was down for the first time in his career in the 4th. Down again at the end of the 8th, he had to be carried to his corner”. In search of even greater glory, Armstrong eyed the World middleweight title with the intent to become the first four-division champion in history. Weighing 142lbs, “Homicide Hank” failed to win it against the heavy-handed Ceferino Garcia in a contest that was ruled a draw despite many in the press believing that he had in fact done enough to win the title and again make boxing history. Later that same year, Armstrong lost the World welterweight championship, the last of his titles, to Fritzie Zivic by unanimous 15-round decision in a bout that according to the New York Times, he was battered badly in the last round and nearly stopped; he was pushed to the canvas right before the final bell. The loss ended his successful welterweight defense streak at eighteen, the most title defenses by a champion ever in the welterweight division. A shrewd if rugged and experienced great fighter in his own right, Zivic purposefully worked the scar tissue around Armstrong’s eyes three months later in the rematch. Armstrong, who considered Zivic a dirty fighter, failed in his quest to regain the welterweight title, losing by technical knockout in 12th round. A couple of years later when they ultimately went on to face each other in a rubber match, Armstrong finally managed to hand his stubborn foe a defeat, but by that time Zivic had lost the welterweight title and was no longer the champion. Armstrong continued to make a living as a professional fighter, notably losing to Beau Jack and a 44-1 “Sugar” Ray Robinson by 10-round unanimous decision in the autumn of his career in 1943.Hanging on well into 1945, the days of his unbeatable rapid-fire attack and larger than life image were well behind him when he hung up the gloves at age 32 with mileage on his odometer that suggested years well beyond his listed age. The final career tally for “Homicide Hank” reads 149-21-10, 101 KO’s, with simultaneous reigns as World featherweight, World lightweight and World welterweight champion – in an era with far fewer weight classes and with fighters that were forged in the furnace of sheer competition. Never again will boxing be blessed with such a hungry, natural fighting machine as Henry Armstrong. An all-time great, he was one for the ages. Next articleDavid Price Proves He Is Britain’s No.1 Heavyweight!